I'm kind of weird about soup. The texture grosses me out, and sometimes there's too much mixing of the things. But this one? This one even soup haters can love. I picked up a slow cooker on sale at London Drugs a couple of months ago. Nothing fancy, just a basic Crock-pot to do my bidding during the day while I lazed about listening to Justin Bieber and stuff. After my initial disgust at slow cooker recipes and their obsession with canned soups and other questionable food products, I found the Canadian Living Slow Cooker Collection at the library. (Side note: If you're looking for cookbooks at VPL, I have them all. Sorry about that). The recipes use real, natural ingredients, are straightforward and versatile, and I haven't had one turn out bad yet. This soup is my favourite, though, and a perfect antidote to the increasingly cold weather that's hitting Vancouver. Even if you hate soup, there's a good chance you'll love it. 1. Preheat the oven to 450F. Peel and cut the sweet potato into reasonably sized cubes. Toss them with half the oil and a small dash of salt, and place them on a baking sheet. Roast for about 20 minutes, stirring occasionally, until they are tender. When they're done, into the slow cooker they go. 2. While the potatoes are roasting, heat the remaining oil in a skillet, and fry the onion, carrot, celery, garlic, rosemary, pepper, and a pinch of salt. Do this until they're softened, which should be about 10 minutes. Plop them into the slow cooker with the chicken broth and water. 3. Cover and cook on low until everything is tender and ready to be blendered-- about 3 to 4 hours. 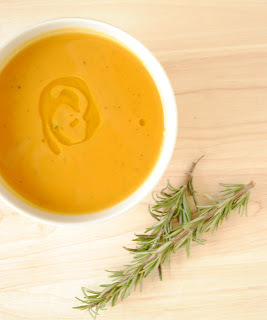 Using an immersion blender (or equivalent) puree the soup until smooth. Refrigerate until ready to serve, or freeze for another day.